Targeted MS analysis (i.e. selected reaction monitoring or SRM) is an alternative to antibody-based assays for the validation of clinically relevant biomarkers, but also has been employed for discovery-based proteomics.1-3 One obstacle of this strategy is that every peptide possesses unique biochemical characteristics. Its amino acid composition and possible post-translational modifications defines its elution profile from the liquid chromatography column, ionisation and fragmentation. For developing a diagnostic clinical MS assay, these peptide properties must be characterised with a synthesised peptide before analysing the peptide of interest in vivo. Peptides also can be synthesised with heavy stable isotopes for absolute quantitation by spiking in a known amount of the heavy peptide into the biological sample. These strategies are also commonly employed to validate results from large scale quantitative proteomic analyses. All our targeted MS products are listed in the catalogue below. If you have any questions about these products or would like a quote then please don’t hesitate to contact us. Below the FAQs are some helpful application notes written by our customers as well as few testimonials. 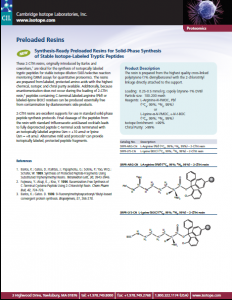 Does CIL provide custom labeled peptides? 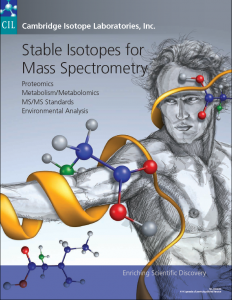 Stable-isotope labeled peptides are used in biomarker discovery and validation as well as in drug and metabolite monitoring, peptide signaling experiments, metabolomics and pharmaco kinetics. CIL is pleased to supply highly enriched and pure amino acids to the world’s leading peptide manufacturers. Does CIL provide preloaded resins?